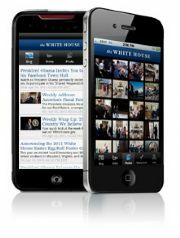 Android users can now download the official White House Android app, a development that ensures that no smartphone user will be left behind. Just like the iOS version, the Android White House app contains behind-the-scenes photos and videos, updates from the blog and the briefing room, and mobile alerts about major events and announcements from the White House. The iOS version also got an update to include an updated photo gallery, social network sharing capabilities for blog posts and videos, and a push messaging feature for those who just can't get enough Obama. President Obama's strategy of using tech to reach out to American citizens is evidently paying off: according to the White House blog, the number of visits to WhiteHouse.gov from iOS or Android devices almost doubled in the past year, from 3.6 percent to 6.6 percent.